The digital worlds are growing together more and more. Just like the music industry that used to deal with nothing but their own media (i.e. records/CD), and today has to face the competition of PCs and the Internet, the phone industry will also fuse with the Internet. Today it is no problem to call up a phone from a computer. There has to be a possibility to go the opposite way and call a computer from a normal phone, of course. There is the difficulty, however, that a PC cannot be addressed by a phone number. This is where ENUM comes in to close the gap. As well as the next problem of switching to another system. The systems for the time being have to exist in both worlds. A ENUM domain is like a directory to match normal phone numbers to internet ones. So ENUM provides the technical background to combine those two. Because of that, most implemenataions of ENUM are not found visible for the user, but work in the background of the existing systems. 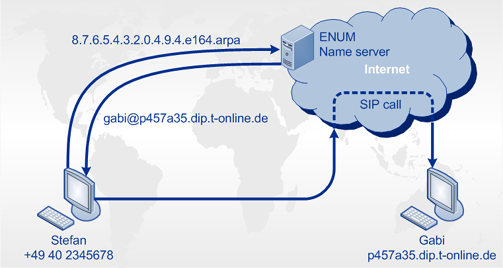 ENUM is the abbreviation for »tElephone NUmber Mapping«. It contains the link of internet domain names on the one hand and the system of phone numbers on the other hand. 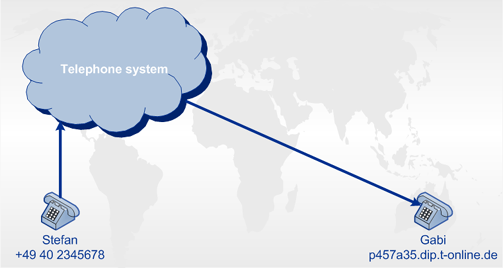 The domain name-system is used as system of addresses. To be more precise, a phone number is registered as the domain name. 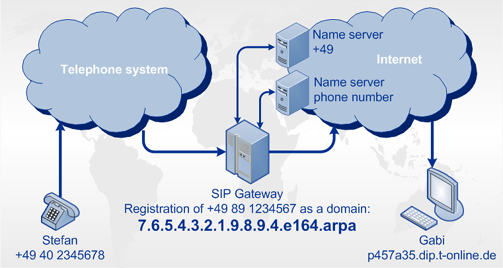 Instead of a usual entry for a www-server, however, an entry is used that indicates under which IP address the voice service is currently available. These entries can be composed in a rather complex manner. You could determine, for instance, that till 6 pm all incoming calls are directed to the PC in the office, while after 6 pm the calls can be taken from a mobile phone. Futher entries could also be applied to fax numbers. It is likely to say that in case the fax is busy the fax can be transmitted as e-mail to a particular e-mail address. As you can see, there are many promising possibilities. In the following, some scenarios of calls are demonstrated. Stefan in Hamburg is calling up Gabi in Munich. Both use a conventional phone. ENUM does not play a role. Call from IP-phone (Computer, PC) to a classical telephone. Gabi is calling Stefan, who is in Hamburg, from her PC in Munich. Stefan is using a conventional telephone. ENUM does not play a role here, either. Only a so-called gateway of a service provider comes into play. Which has to be payed for. Stefan is calling Gabi's internet phone (e.g. a PC) with his conventional phone. Here, the registered ENUM-domain comes into play. The phone system checks whether the number to be called has been registered as a domain. If so, the internet address to direct the call to is being determined by two enquiries to a name server. 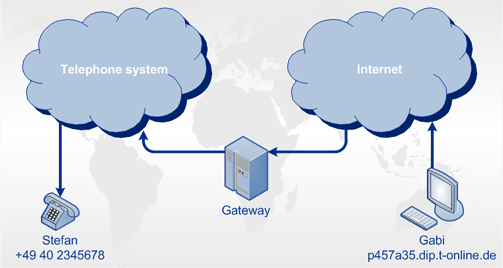 Then, the call is switched forward via a so-called gateway. Both Gabi an Stefan use a IP-phone (e.g. as a Software on their Computer or in the PBX system via VoIP/IAX). As Stefan is calling the phone number of Gabi, the system automaticly checks her ENUM entry and autmaticaly connects through the internet. This way, they have a point-to-point connection, whith no extra-costs other then the internet connection and have no third party like the service provider involved.